We are delighted to announce an exclusive partnership with Marcus Wareing’s London restaurant, Tredwells. A bespoke food and cocktail menu inspired by the world-famous Dahl classic will be available until 31 August 2019. 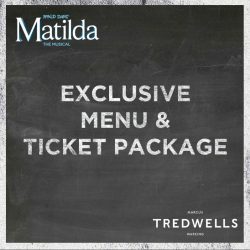 The partnership offers theatre lovers the opportunity to enjoy a special Matilda menu, including a free meal for the children or a cocktail on the house for an adult, before watching the award-winning Matilda The Musical live on stage in the West End. Tredwells is the ideal restaurant for a pre or post-theatre meal, located just a 2-minute walk away from the Cambridge Theatre. This uniquely crafted menu (available to download here), features a selection of delicious mains, deserts and non-alcoholic cocktails for the children alongside a mouth-watering selection of cocktails and mocktails for adults. This exclusive package is available from £72.50 for one ticket and a two-course meal, and from £77.50 for a three-course meal from the 11th February to 31st August 2019. Click here to buy your ticket and meal package.